As I am writing, exploring the archetype of the motherless goddess, who never got to be a child, but rather sprang as an adult, in full armor, from her father’s Zeus’ forehead, it appears to me that even on the outside the theme of Athena’s return to the root of her feminine wisdom, is making it’s presence felt on a geo-political level. I could see it in the tough, but spirited , negotiations of the young Greek government with the European Union and their creditors, large banks and fiscal institutions, on matters of their political, economical and monetary survival. I have been following the unfolding story, a drama in the classic sense, with interest and for a long time now. It appears that Athena’s reflection of remembering her mother and her roots, are playing out in the political landscape, directly affecting matters of choice, and decision making. At this moment, the Greek government just called for a snap referendum, a move severely criticized, if not condemned by their creditors, and the world is watching the ensuing tumble of the markets, as investors pull out, fearing loss, and politicians sputter words of confusion, in the unpredictability of a move that has become a game changer. Is there some Pallas energy at play ? A departure from complying with the old patriarchal rules, to listening to the voices coming from the people ? Is this Pallas deciding to no longer be a good daughter, but rather follow her wisdom and instinct, her heart even, that for so long has been hidden and protected under her golden breast plate ? 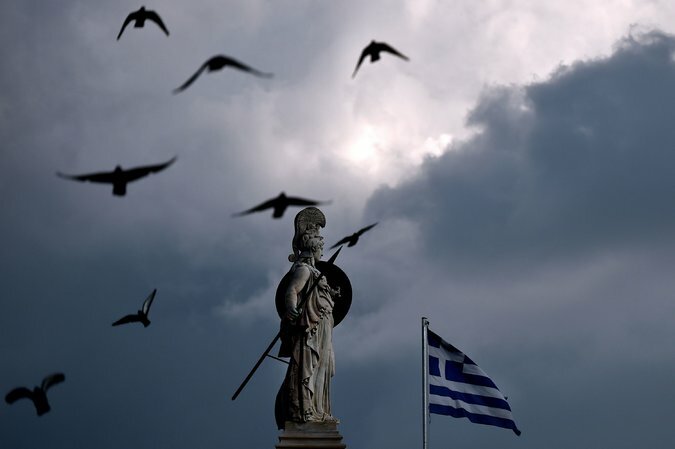 After all, Greece is the cradle of democracy, and far from holding on to a romantic view of the dramatic events, I cannot help but notice that it all seems to shift into a new playing field right now. The negotiation with the creditors, representatives of other European member states and international fiscal authorities came to a halt, a small team of leftist renegade politicians, inspired and moved by the need of their people more than the instinct of keeping the status quo, are rekindling a new way of living together, calling for a plebiscite for it’s citizens to decide on their own fate. Democracy, a Greek word, derives from demos “common people,” and kratos “rule, strength”, pointing to what politics really is all about: governing the affairs of a state, in unison, not separate, from the people who voted for their representatives. For me the events in Greece and their affect on the European Union, and of course beyond, is a highly symbolic event, indicative of a major change in the way we wish to live and make decisions. No longer the victim of circumstance, resorting to ignorance and denying our innate power, but rather taking responsibility for one’s own choices. What I also notice is that a while ago, I came upon these archetypal Pallas Athena energies in myself – the warrior and the wise woman. They have been represented by souls I have been interacting, on the seen and more so on the unseen dimensions, and who continue to have a significant influence on my journey. I have noticed a subtle shift that can be attributed to Athena’s path towards a more balanced stance between her two aspects, no longer competing, or denying, but playing together, informing and complementing each other, as powerful energies, being summoned for a communal intention. And so let us prepare for Pallas Athena, the strategist and standard bearer, to lead us into a new territory. 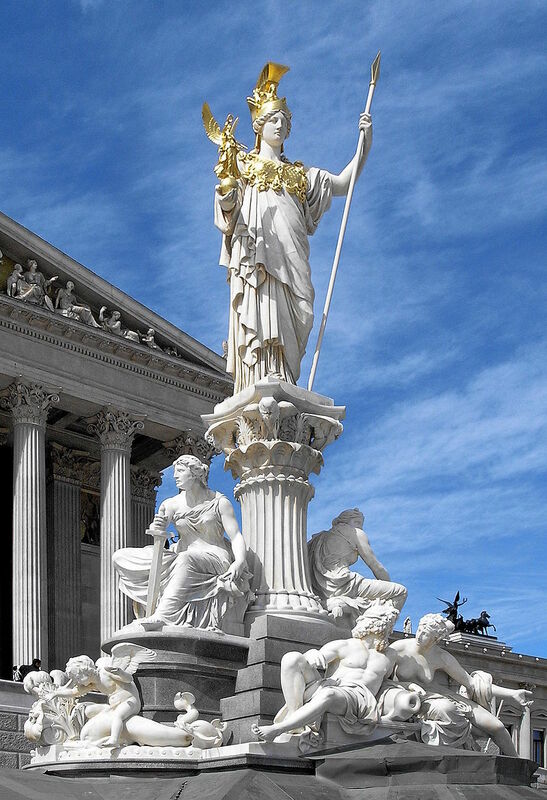 In the Athens of ancient Greece stood a colossal bronze statue of Athena Promachos, literally Athena who fights in the front line, overlooking her city for over 1000 years. 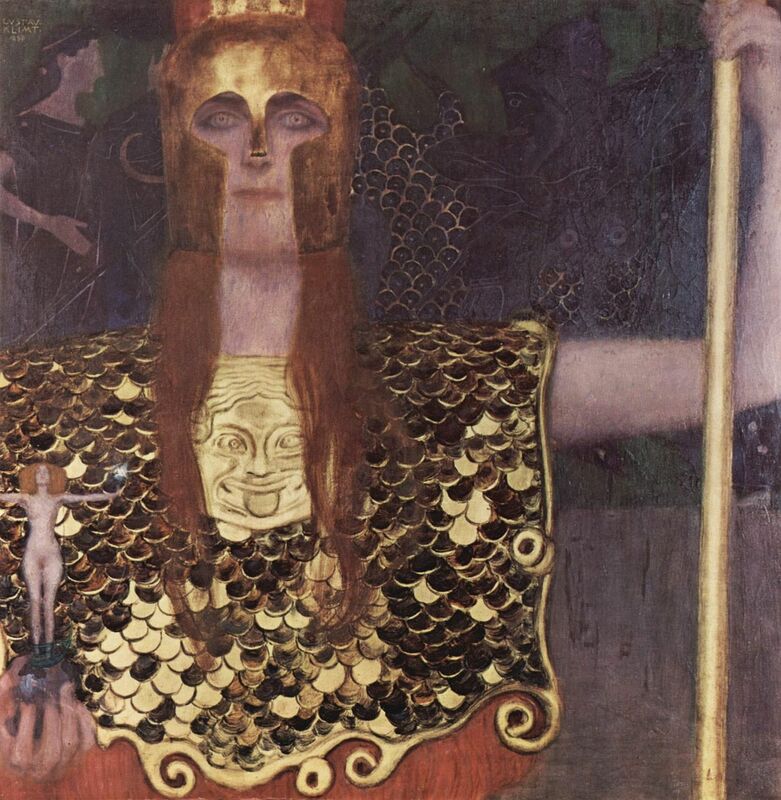 Athena Promachos perhaps inspired Gustav Klimt’s painting of Athena, with her piercing grey eyes and golden armor. This painting can be seen in a Viennese Museum, not far away from my home, and what draws my attention is the image of a mask worked into her breast plate. Its a Gorgon, a terrifying creature with fangs and bloodied tongue, whose stare turns the onlooker into stone and figures of Gorgons have been used for protection. It is interesting to me to notice the presence of three pairs of “seeing eyes” in this image. There is Athena’s grey-eyed stare, stare, the bulbous look of the Gorgon protecting her jugular, and not to forget, the annular eyes of her sacred bird, the owl on her left shoulder, being able to see in the dark. The mask, the Greek term for it is persona, is also a symbol for concealing one’s identity, and it may point to an area, Athena still feels vulnerable, as the goddess, the warrior, protector and patron, may be reminded of the woman beneath, who is a weaver and skilled artist, and who is said to have invented the flute. After all, the byname “Pallas” reminds us of Athena’s youth as a foster child in the house of Triton, the messenger of the sea, half human, half fish. As the story goes, Athena accidentally killed Triton’s daughter Pallas with her spear, and inconsolably, took on her name. Pallas means – girl. 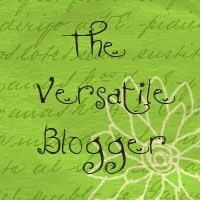 And so, to really access her innate wisdom, this is what Athena may have come to terms with: if we don’t know how to handle emotional states with equanimity, integrity and clarity, we never fully enter adulthood, remaining in a fearsome state, like a child feeling inadequate or overwhelmed. This is about trust in not only being protected, but also in the wisdom of not knowing. Athena the weaver is changing strategy. No longer will she be in charge, take charge or charge, but she will rather move about leisurely, one step after the other, picking up the threads of the weave, patiently and curiously, bringing it all together, integrating and creating, a new chapter of the story. And it would not be a very good parable, if there was not a personal edge to it, a core truth, something to make it relevant. This posting unfolded over several days, step by step it came into clarity, the threads weaving a pattern of purpose and meaning. There has been an incident when I was young, about 11 years old. An accident that left my younger sister, who was in my care at the time, injured and hospitalized. That was my Pallas event that made me feel guilty and having failed my mother’s trust for most of my life. At the time I was not able to process and integrate the intense emotions that were triggered by the instance, and it stood at the beginning of a series of circumstances that only deepened my feelings if inadequacy. I did compensate for it in other areas of my life, Like Athena, I knew how to use knowledge and strategy, how to fight in the front line, be in charge, take responsibility, take care of others – and yet was betrayed so many times. At the root just a sense of inadequacy, ancestral perhaps, or a core wound, transferred over many generations and of collective relevance. A sense of ” I cannot”, that was the driver of great achievement through effort. This is what I feel changing in myself . With the awareness of a hidden and half-forgotten part, protected by a Gorgon, came also the solution expressed in the transmutation of energy, and behind a wall of fear and terror, there was a immature part of myself, that needed to resource itself differently by seeing inadequacy turn into resourcefulness and remember the wisdom that opens up in this process.